One of the most famous and best known images of a train on a wooden bridge with the River Kwai below is actually taken near Krasae Cave which is a couple of minutes walk from Tham Krasae station. We got off the train here and had lunch at Tham Krasae restaurant. The restaurant is set over a couple of levels and it is full of tourists. Lunch is buffet style, nice but nothing special but it is the views here which are spectacular. A couple of minutes walk along the railway tracks brings you to Krasae Cave, this cave is believed to have been a camp site for Japanese soldiers during the construction of the Death Railway. The cave now houses a Buddha statue and some important Buddha relics. This is one of the most dramatic sections of the Death Railway and you can actually walk from here to back towards the Wampo Viaduct but it is quite dangerous as you are walking on old railway tracks with nothing to hang onto, water below you and if a train comes there is nowhere really to go to get out of the way. This is the 3rd time I have been on the Death Railway and the first 2 times we got off the train at Namtok Station which is the end of the line. But getting off a stop earlier at Tham Krasae was definitely the highlight. 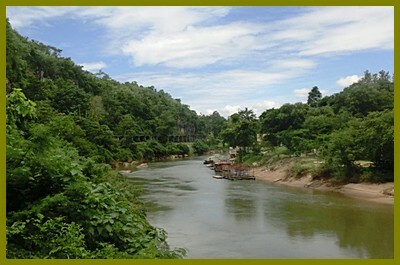 Tham Krasae is about 65 kilometers from Kanchanburi.